As a founding member of the Sustainable Furnishings Council, our passion for promoting and creating sustainable practices is woven through every product we offer. Read on to learn more about some of the materials used in our rugs and what makes them good choices for your home and for the environment. According to industry sources, between four and five billion of pounds of used carpeting end up in landfills every year. ECONYL® yarn is made from materials such as discarded fishing nets, used carpeting and other nylon waste, keeping these materials out of the waste stream. These materials are transformed into a high-quality raw material that is soft, durable and holds dye well. Perfect for high-traffic areas, we designed this rug's timeless graphic pattern with a nod to the discarded fishing nets that help make up its yarn. It's simple: Sheep grow new fleece every year, which makes wool a renewable resource. This beautiful natural fiber is resilient and durable, which means wool rugs last a long time and don't need to be replaced. Additionally, lanolin, found naturally in wool, acts as a protective layer which helps rugs resist stains without the use of chemicals. 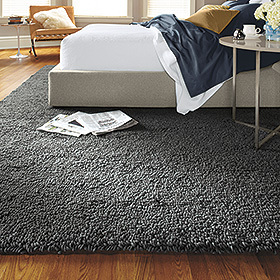 Made from pure, felted New Zealand wool, our Arden loop rugs and shag rugs feel incredibly plush underfoot. 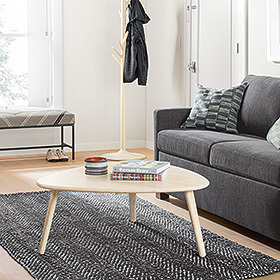 This rug is machine woven in the U.S. and has a minimal backing for a modern look. Did you know a jute plant can grow up to 12 feet high in just four to six months? This sustainable resource features long fibers that are strong, durable and naturally color-fast. 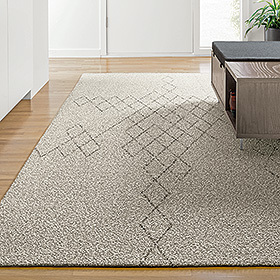 We designed these rugs with an open weave and a modern, graphic pattern for a casual look. Handwoven on traditional looms, the inherent texture and dimension of jute shines through.